I must be going through some kind of secretive phase at the moment. After my last post the SShh!-Fest that is the YA novel “Only We Know”, here is Chicago born Andrew Rosenheim encouraging us to keep mum in his 2006 publication. Rosenheim came over to Oxford to study and following his time there had various jobs in publishing at Oxford University Press and then as Managing Director at Penguin Press. He has been a full-time writer for the past fourteen years and this was his second of his 10 published works. I first came across this book when it appeared on the excellent list that was produced by the World Book Day- Spread The Word 2008 A Reading List of 100 Books To Talk About. I loved this list and have read a good number of books upon it and keep it to this day. I don’t think there has been anything like this since. I’ve just dug out my copy and had a little count up. I have read 31% of these and they were all new authors to me and have led me on to reading many other books by these authors. I suppose in 2008 we didn’t have so many lovely book bloggers reviewing and recommending. Anyway, onto Rosenheim’s secrets…..The novel has two narrative threads in quite lengthy chunks. In the first an American boy witnesses his uncle’s murder in his orchard and keeps it a secret and in the second the now grown-up boy begins a relationship with an English woman who is also keeping secrets from him. The book begins powerfully and is gripping and thoroughly involving but the “modern day strand” is, by comparison, not terribly interesting and it came as a relief to me when the book switched back to the boy Jack Revoir to explain how he came to be at his uncle’s farm at the time of the murder. The modern strand also resumes, but it never seems to get going. Jack’s love interest isn’t particularly likeable and the section with her English society family feels really quite lifeless after what has come before. I am certainly interested in reading more from Rosenheim but feel he may be most effective when his writing has that tinge of nostalgia about it. His 2012 novel “Fear Itself” is set in America during World War II, so maybe this should be where I go next. Rosenheim was a survivor of the horrific Paddington Train Crash in 1999, which led, in least in part, with his decision to quit the 9-5 working world. His account of this time in his life can be found in his Kindle Single publication “The Secrets Of Carriage H” – a 75 page work which has found great favour amongst Amazon reviewers. I’ll tell you a secret …………..I do not think that this book will be the last Andrew Rosenheim I will read. 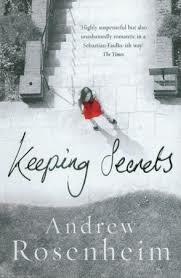 “Keeping Secrets” was published in hardback in 2006 by Hutchinson and as a 2007 Arrow paperback. This entry was posted in Murder They Wrote... and tagged Andrew Rosenheim, Crime Book Reviews, crime novels. Bookmark the permalink.